If the original RX-7 had been the first viable Japanese alternative to a Porsche, then its successor was aimed even more squarely at the German marque. Just as Toyota's Lexus designers looked long and hard at the S-Class Mercedes-Benz in styling their new flag?ship, so too, had Mazda studied the Porsche 944. 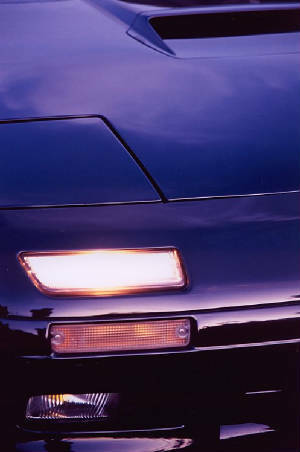 Their aim was to develop a unique sports car that matched the 944 in all important respects except price. In achieving this aim, it has been argued, they sacrificed something of the original car's charisma. 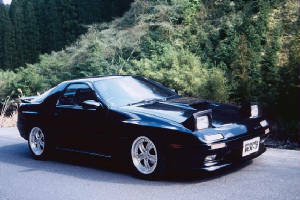 While the FC RX-7 finished up looking very Porsche 944, the first shape RX-7 looked like nothing else whatsoever; its styling was unique. The most remarkable aspect of the old car was just how good it was, considering that so much of its componentry was basically Mazda RX-3. It proved that thorough engineering is just as important as innovative design. With the new FC RX-7, of course, we got both. 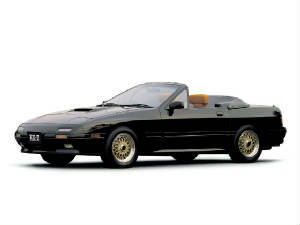 Unspoiled by any overt compromises such as a live rear axle, the sports car for the second half of the '80s and for well into the '90s was closer to what Mazda's engineers saw as the ideal sports car. Steering was by rack and pinion and that independent rear suspension incorporated some particularly advanced engineering. Having established the RX-7 as desirable yet affordable, the designers had no intention of departing too radically from the concept. What they wanted was a better RX-7 that would still win custom from those who had owned the earlier car. But what would it be called? RX-7? RX8? From the time the RX-2 supplanted the R100, there had been a generally linear progression in the nomenclature of Mazda's rotary-engined cars. There was no RX-6 because it was felt that the name didn't exactly trip off the lips. 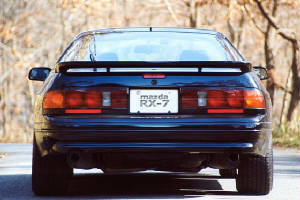 In his coffee table book, 'The New Mazda RX-7 and Mazda Rotary Engine Sports Cars', Jack Yamaguchi explains why this so-new car retained the old name: "The rationale was that the RX-7 had become a household word, particularly in the all-important American market, that would continue to strike the right note with the world's enthusiasts. Further, reasoned the 7 proponents, if the car is good, the name should be good; if the breed improved, the established name would take on the intended connotation of newness and increased product value". The development code P747 had no particular meaning; it was chosen so as not to give any hint about the vehicle's type, year, configuration or engine type. The concept was settled and so was the name, but near the end of the development program, a one-month moratorium was called. This occurred in May 1983, when the design was almost complete. Why? America's Gas Guzzler Tax was worrying key Mazda executives. Much energy went into removing weight from the car and the result was that the FC RX-7 has more alloy components than any since the original R360 two-seater, which tipped the scales at barely 380 kg. Among the many alloy components are the front suspension arms, the engine mount bracket, the front brake calipers and the bonnet. Even the jack is an aluminum item, which saves about 1.3kg over a steel one. At around 1230kg (depending on model and equipment fitted), the RX-7 cannot be considered a real lightweight. It was a decent amount heavier than its predecessor, depending upon equipment levels. If the increase in weight was close to unavoidable given the design parameters, at least an improvement in weight distribution was achieved. The old car had been slightly nose-heavy with 54% of its weight hung over the front wheels. But the new car - with two occupants and a full tank of fuel - achieved the magical 50:50 ratio. The real downside of the weight increase was that the 13B engine was required simply to maintain the performance level of the old 12A-powered car. Originally, the non-turbo FC RX-7 recorded the same time through the standing 400 metres test as its predecessor - an even 17 seconds. This is a reasonably quick time but not really for a car with such rakish design and such serious intentions engineered into it from the start. In styling the 'Porsche-style RX-7, the designers presented the engineers with a list of the features they wanted to see in the new car. Several of these had never been included in any Mazda car. They wanted a steeply raked windscreen for aero?dynamics. There should be, they said, as small a gap as possible between the tyres and guards to emphasise the big wheels/tyres look. A short rear overhang, a CD factor below 0.30, a one-piece glass pane integrating the rear window with the quarter lights, hidden drip rails and flush door handles were also on the list. The 0.30 CD wasn't quite achieved, but 0.31 for the base model equipped with twin streamlined mirrors wasn't a bad result; in 1985 few production cars could match this figure. 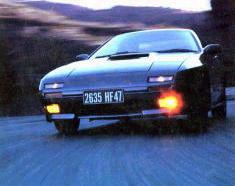 In the Australian context of 1986, however, the more accomplished new RX-7 faced a difficult task. The price had leapt dramatically; with Australia's weakening dollar the major reason. 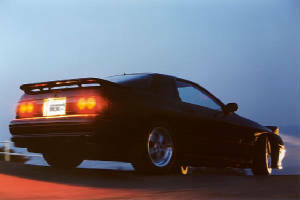 The top of the range series 3 RX-7 had retired at around $27,000, but even the cheapest variant of the new car, the Sports, demanded $39,470 from customers. What they got was a more substantial, better handling car. But they weren't overwhelmed with the performance. 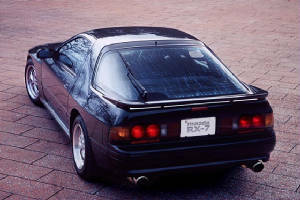 In fact, Mazda's failure to make its new generation RX-7 significantly quicker than the earlier model aroused some criticism. Once the Turbo model arrived any objections to the performance level of the standard car were overshadowed. In reality, there were now two different RX?7s. In late 1986 the RX-7 Turbo had few peers. It cut through the standing 400 metres in just 15.4 seconds. But the magic or this car was not revealed by the stop?watch. Here, at last, was the definitive rotary Mazda. By complementing the tremendous top end power that is intrinsic to the Wankel engine with the huge mid?range thrust that is provided by a turbocharger, the Mazda engineers gave performance car lovers the best of both worlds. With scintillating performance finally on hand, the real advantages for the driver of that clever rear suspension made themselves more apparent. Called the Dynamic Tracking Suspension System (DTSS), it was a system which changed itself according to the road and driving conditions. It incorporated a triad-pivot floating hub that controlled the wheel's toe attitude under specific load conditions and a multi-link/pivot arrangement that compensated for camber changes and provided anti-dive and anti-squat effects. To put it simply, under mild cornering conditions the rear wheels exhibited mild toe-out, which aided turn-in. Press hard, however, and the hub assumed a toe-in attitude, the degree of which depended on the wheel loading. This was in essence, Mazda's first attempt at four-wheel steering. 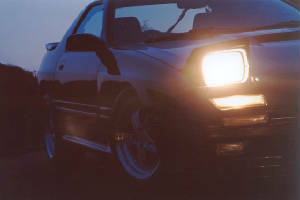 In 1989 Series 5 model was introduced. 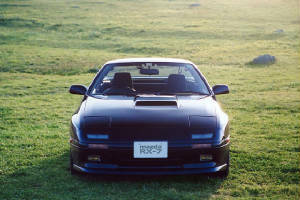 The FC RX-7 was now a serious supercar, quicker than the Supra Turbo and much nimbler. its standing 400 metres time was down to 15.0 seconds and it could travel from zero to 100 km/h in 6.8 seconds, compared with about eight seconds for its predecessor. 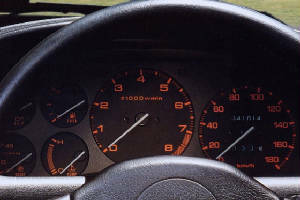 The combination of a state of the art turbocharging system with the rotary engine meant an almost complete lack of the kind of turbo lag found in such rivals as the Supra. Released in February 1986 and available until November 1991, the model was available in 3 specifications, Sport (Non Turbo), Turbo II (Turbo version obviously) and Convertible (Non Turbo). 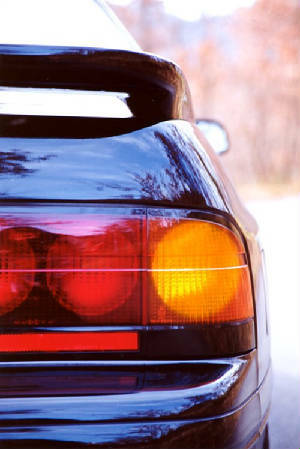 The series 5 had round tail-lights, linking back to the earlier rotary models, compared to the more square design of the series 4. It also had colour-coded strips on the bumpers and doors, whereas the series 4 models were black. 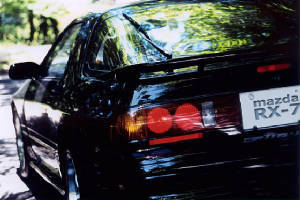 The turbo models also featured a bonnet scoop designed to feed air to the top mounted intercooler. 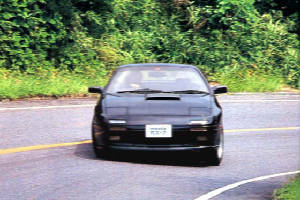 A convertible version was also available in this shape with Australia receiving a naturally aspirated version, whereas Japan had a turbo version. One of the better sports cars of the 80's, it is now quite a bargain sports car compared to what is available at its price. It still has a distinctive style that hasn't aged as much as other mid to late '80's sports cars, it features the unique rotary engine and in turbo form can still match today's sports cars with a few select modifications. The 13B Turbo engine is also used extensively for conversions into earlier model Mazdas as it combines the power of a turbocharged rotary engine with the reliability and design of a more modern and electronic fuel injected rotary engine. -Soft facia bumper, integrated air damp w/ brake ventilation slots which cut the air, and view ports so you can "flash to pass" when lights are retracted. 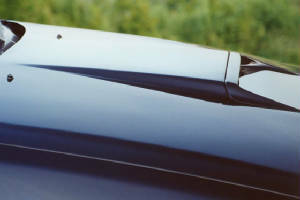 -Tapered hood, flush mounted 65 degree angle windshield; which contribute to a low 0.31 drag coefficient. -Special 5-speed overdrive w/ hydraulic clutch linkage provides tight, interactive feel, and percise shift action. -Inclined single A-arm, modified strut front suspention. Toe-in, chamber, neutral; caster, 5 degree positive. Special double-action busings resist lateral forces to enhance direct steering feel, yet flexs easily to foreaft forces to damp road vibrations. -Ventilated front disc brakes w/ single-piston sliding calipers and extra large pads. Sport package, GXL, and turbo have racing-type 4-piston fixed-caliper discs. -New rack-and-pinion steering system combines smooth, quick maneubering, control w/ tight steering feel. -Air-skirted side mirrors, single-panel doors, flush glass, sculptuted fenders fenders, and unibody construction lend structural integrity and design unity, and smooth air flow, cut wind noise. -Wide-track stance, front and rear stabilizer bars, low center of gravity, and near-perfect balance of weight between front and rear wheels contributes to the RX-7's incredibly sure road poise. -New dynamic tracking suspension system uses the rear wheels to actually help steer you through tight turns w/ new agility and precision. Unique triaxial floating hubs provide sophisticated "Toe control" to steer rear wheels from "toe-out to neutral to toe-in" automatically, and provide optimum maneuverability and stability in all situations. -Separate differential and suspension mountings neutralies negetive interaction between these components, moximizing new rear suspension functions. -Unique camber control system helps wheel traction & road control through corners & over bumps. -Double-arc contoured one-piece rear hatch w/ 18.5 degrees angle provides near-ideal air management. -Vertically mounted compact spaire tire just inside hatch opening. Probably the most impressive point of the rotary engine...the size and weight, allowing the near perfect 50/50 weight balance between the front and rear tires.